I know I have said this before but I love Chinese food. It is quick, easy, healthy and, usually, cooked in one pan so saves on the washing up. This recipe was a little unusual as it contained some spices I would normally associate with Indian food rather than chinese. Does that make it a fusion dish? I wouldn’t like to say as this terminology still confuses me. Regardless of whether it is fusion or not it tastes absolutely wonderful. I found the original recipe on the Kikkoman web site but have changed it quite a bit to use ingredients I had to hand. It still tasted absolutely wonderful and is one dish I will be making again and again. Cook the noodles as per pack instructions, drain and keep warm. 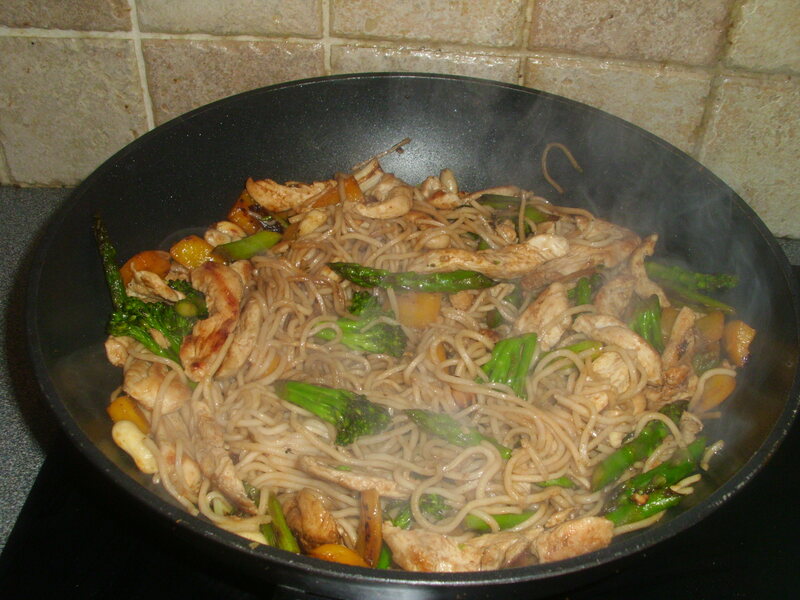 Heat 1 tbsp of the oil in a wok, add the pepper, broccoli, asparagus and spring onions. Stir fry over a brisk heat for 5 minutes. Add the peanuts, stir fry for 1 minute then remove from wok and set aside. Add the remaining oil to the wok , heat and stir fry the chicken for 5 minutes. Add the cumin, coriander and chilli powder and stir fry for another minute. return the vegetables to the wok and toss with the chicken. Add the noodles, soy sauce and rice wine. Toss everything together until piping hot then serve in warmed bowls.